Motorola unveils Moto G7, G7 Play, G7 Plus and G7 Power smartphones. 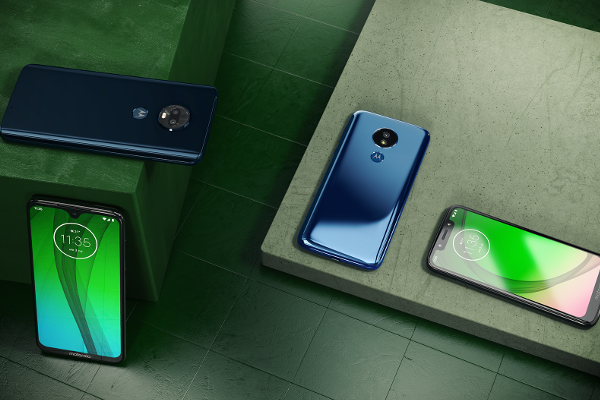 Lenovo-owned Motorola today announced the launch of its Moto G7 series at an event in Brazil. The new smartphones which were launched in this line-up are the Moto G7, Moto G7 Play, Moto G7 Plus and Moto G7 Power. The newest generation of Moto G phones come equipped with exclusive Moto Experiences like Quick Capture, Fast Flashlight and Attentive Display. Newly redesigned One Button Nav replaces navigation buttons with one simple on-screen bar. All the phones in the G7 Series, which includes Moto G7, Moto G7 Play, Moto G7 Plus and Moto G7 Power, run on stock Android 9 Pie. Moto G7 sports a 6.2" Max Vision Full HD+ display with an upgraded, contoured Gorilla Glass design. The 12 MP dual camera system is equipped with blur effects, Spot Color, Auto Smile Capture and Google Lens. The Moto G7's Snapdragon 632 Mobile Platform can tackle most of your intensive creative tasks. It's equipped with TurboPower charging and an all-day battery. The moto g7 is available today in Brazil and Mexico. The moto g7 will be available from mid-February throughout Europe. It will roll out over the coming month in various countries in Asia Pacific, Latin America and North America with a starting MSRP $299 USD. The Moto G7 Play comes with a 5.7" Max Vision HD+ display with a 19:9 aspect ratio. With a Snapdragon 632 Mobile Platform, the Moto G7 Play is 60% (110 % in U.S. and Canada) faster than the previous generation. It has a 13 MP rear camera with PDAF and zero shutter lag, which focuses on your subject in the blink of an eye. Motorola's Moto G7 Plus features a 6.2" Max Vision display with Full HD+ resolution, amplified by Dolby Audio crystal clear stereo speakers. It has 16 MP dual camera system with optical image stabilization. Plus, new camera software and AI helps you shoot like a pro with amazing features like Smart Composition and Auto-Smile capture. It's powered by the Qualcomm Snapdragon 636 Mobile Platform and comes with an all-day battery with 27W TurboPower charging for 12 hours of power in only 15 minutes. The moto g7 plus is available today in Brazil and Mexico. The moto g7 plus will be available from mid-February throughout Europe. It will roll out over the coming months in Australia and in other countries in Latin America with a starting MSRP of 299.99€ EUR. The Moto G7 Power flaunts a 6.2" Max Vision HD+ display. It is powered by a Snapdragon 632 Mobile Platform. It's backed by a 5000 mAh battery with TurboPower charging, so you can work and play for 60 hours (up to 3 days in the U.S. and Canada) on a single charge. The moto g7 power is available today in Brazil and Mexico. The moto g7 power will be available from mid-February throughout Europe. It will roll out over the coming weeks in India and the coming month in various countries in Asia Pacific, Latin America and North America with a starting MSRP of $249 USD.